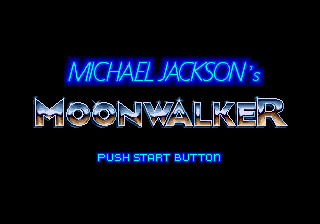 This page details one or more prototype versions of Michael Jackson's Moonwalker (Genesis). Add pictures, music and sounds. Find more differences if possible. A sample version of Moonwalker was discovered by brian the hedgehog in September 2017, and later acquired and dumped by Landon White who released it on August 6, 2018. This build is dated April 24, 1990, four months prior to the final release, and contains many differences - most notably the presence of a full version of "Thriller", which was removed from the final version. The prototype's ROM header is copied from Kujaku Ou 2. "PUSH" was changed to "PRESS" and a ™ symbol was added. Stage Select is activated by default. The Sound Test lists the music tracks as Round 1, 2, 3, etc., instead of listing the song name as in the final version. 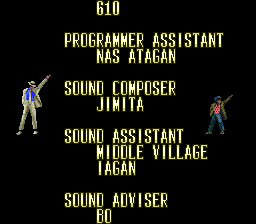 The miniboss, boss, ending and a couple dance themes are included; in the final game, only MJ's songs are included in the sound test, along with his voice samples. Pressing Start on Controller 2 pauses the game. The door sound at the beginning of Round 1 is bugged and messes up the console's SPU so certain sounds won't play until you defeat an enemy. The Magic attack sound processing is glitchy and the magic sound can play indefinitely at times. There are no gameplay demos. A splash screen of copyrights is displayed after pressing Start on the title screen. This only appears in the final when you wait for the demo to play. There is no time bonus screen after each level in the proto. There are no continues in the proto. In the final game, you have infinite continues. Enemies fly away slower and at less dynamic angles when defeated. If you use up all your magic/health and don't have enough to do a dance sequence, nothing will happen in the proto, while in the final you'll always do the hat attack. Making contact with Mr. Big does less damage in the prototype. Bullets from the mobsters in Round 1 kill in one hit, and their attack animation is much slower to compensate. I wasn't able to knock away one of the debutantes in Round 1; I had to move back before I could hit her. The cats in Round 1 are bugged: they jump much lower than usual, and cannot leap over objects - instead, they'll either just jump through them, or in the case of pinball machines, they will freeze in place and move in the direction they were travelling until they leave the screen. The bosses of Round 1-2 have more health, and some pinball machines are missing. The boss of Round 1-3 is bugged: there are three of the same bosses from Round 1-2, but killing them does not end the level properly and you'll be stuck forever. Presumably, this is why the level select is naturally enabled. The dogs in Round 2 are more aggressive: they don't walk near you and bark, they usually just collide directly into you. The time bombs in Round 2 are conversely more passive, and content to just sit in the window/car trunk/dumpster you found them in and explode rather than jumping out at you and bizarrely doing contact damage. The lifts in Round 2-2 don't move floors with you. Mr. Big's speech balloon gets caught behind the background at the 2-1 boss. The AI of the boss run in Round 2-2 is more glitchy. The suited men are more apt to fire on top of the car, above your head. The girl that appears when you defeat the boss of Round 2-2 can spawn incorrectly above the ground if you were above it when you killed the last guy. The boss of 2-3 is just a bunch of dogs walking along the ground at you mindlessly. The player can only open the graves in Round 3 by using a ducking attack or by pressing A for the spinning attack. The final game lets you open them by pressing Up, but leaves them unaffected by the spinning attack. The zombies in Round 3 only need to be hit once to be defeated. In the final, they have to be hit twice. The boss of 3-2 are just a bunch of zombies walking at you mindlessly. There are no superzombies, and the normal zombies walk slower. The same applies for 3-3, yet another crowd of zombies instead of the two superzombies in the final, although the zombies in this fight move faster. The Spider and "No Moonwalking" walls in Round 4, like the gravestones in Round 3, can't be opened by pressing Up in the proto. They can only be opened with either the Magic attack, the special attack used when you press Up + B, or by Moonwalking by holding B. The small spiders in Round 4 are less aggressive. The stalactites in Round 4 once again do minimal damage to enemies instead of killing them in one hit. Enemies can be protected from being hit by standing behind the large rocks in Round 4. Seems to be a collision issue. Many spider and "no moonwalking" symbols are interchanged between the proto and final. The suited men can get stuck midair if you kick them off ledges in Round 4 and 5. Mr. Big's face palette is messed up in Rounds 4 and 5 and alternates between red and yellow. The 4-1 boss run includes zombies. In the final, there are only suited men. The 4-2 boss run is more of the same from 4-1. This combined with the one-hit laser kills actually makes this fight incredibly (if not impossibly) difficult. The lasers shot by the enemies in Round 5 kill Michael in one hit. The ceiling lasers in Round 5 are destroyed in one hit in the proto. Destroying the computers in the final game will disable nearby ceiling lasers. In the proto, this doesn't happen. Minor layout differences in 5-2. 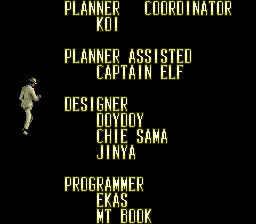 The boss location is different in 5-2 and is another run of normal suited men (in the final the boss is three green suited men). You can still get one-shot by the lasers during the 5-3 boss as the Michael robot. All the enemies are regular suited men instead of green suited men. Just as well, the 5-3 fight doesn't seem to have an ending yet - enemies spawn infinitely. I got stuck in mid-air walking off a teleporter in Round 5 once. Suited men attack close-range in the proto by... spinning in place. In the final, they have a proper rifle bash attack. Enemies (suited men) aren't layered properly when they fall through the trapdoors in Round 5. Turning into Michael's robotic form always plays "Bad" instead of the current stage music, and it doesn't have a radar function showing the locations where the children are hidden. The Michael robot's lasers do far less damage to enemies in the proto, and they are defeated normally rather than exploding. There is a score bug that occurs occasionally when defeating enemies that sends your score into the high hundreds of thousands, if not the maximum of 999,999. Round 6 is completely different from the final. Instead of chasing Mr. Big in space, Michael pilots some sort of cannon and has to shoot another cannon (presumably piloted by Mr. Big) in a cliff side. The enemy cannon appears to not register any hits despite playing a different sound when you shoot it, and his shots also lack any sort of collision. It's impossible to win or lose, rendering the stage unbeatable. Normally, you cannot select any level of Round 6 but the first through the level select. Forcing the game to select Round 6, Scene 2 will play the ending and credits. Round 6, Scene 3 is a glitched version of Round 1-1 with the laser cannon from Round 6-1. The cursor in the main menu is Michael's bare hand, unlike the sparkling red glove in the final version. The crows in Round 3 are colored black. They were changed to red in the final, probably so that they would be easier to see with the dark background. Round 3 plays a full version of "Thriller", absent from the final version, which replaced it with "Another Part of Me". "Billie Jean" is in an earlier state, with some different notes compared to the final version. "Another Part of Me" is not present in the prototype. This possibly indicates that it wasn't added until after it was decided to replace "Thriller" with a different song. The credits sequence is slightly different, showing Michael dancing alone, unlike in the final where a child is seen dancing with him. Several grammatical fixes to the role titles. 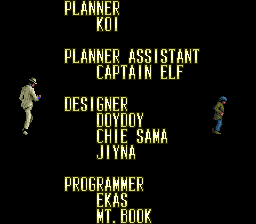 There was supposed to be an "&" between "PLANNER" and "COORDINATOR" in the prototype, but that symbol doesn't exist in the font graphics, so it doesn't appear. "JINYA" was changed to "JIYNA". A period was added between "MT.BOOK". 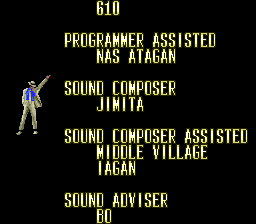 It's actually spelled correctly in the prototype ROM, but the character to display a period is supposed to be a "<", so it was fixed for the final game. Al Nilsen, the director of marketing at Sega of America at the time, was given a special thanks. 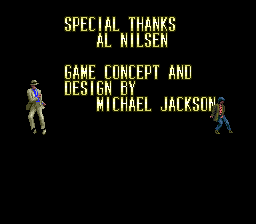 Michael Jackson's role was changed from "supervisor" to "game concept and design". The "END" text is just part of the text scroll in the prototype. 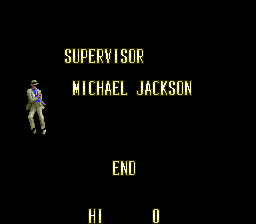 In the final game, Michael throws his hat, which causes the text to appear. Michael continues to dance as the screen fades out in the prototype. In the final game, he and the kid strike a pose. This page was last modified on 10 August 2018, at 19:04.